I was listening to a podcast with comedian W. Kamau Bell. It was recorded previous to the incidents on the steps of the Lincoln Memorial last weekend, but there were some very timely insights. “Wasn’t my best self.” Does that phrase perfectly capture this past week or what? 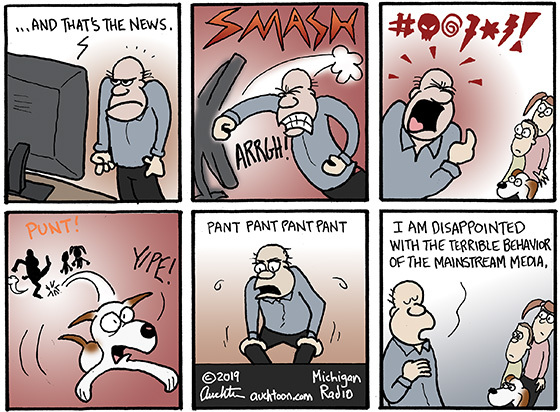 I think that also goes for how news is reported. The initial reactive stories last weekend were obviously not good. And if you are inclined to blame “the media,” well, I would agree. But I would hasten to add it was social media and cable news that were by far the worst offenders, and they are hardly actual journalism. The stories reported by reliable news sources (NPR included) were certainly incomplete, but they were quickly followed-up and fleshed out — and continue to be as the story develops. Life surprises us all the time, and yet we’re still rarely ready to react exactly the way we’d like. So it’s likely that, in the moment, we may lash out at a smirking teenager or repost conspiratorial memes. But the real question is: What are we going to do after that to be our best selves? And this brief anecdote: In a recent episode, several souls arrive in what they believe to be the good place, but in a very unorthodox, backdoor sort of way. It appears they have not been detected, and there is some concern that when found they might be kicked out (and sent to the bad place). In Michigan, if you get hurt in an auto accident, your medical expenses can be covered. 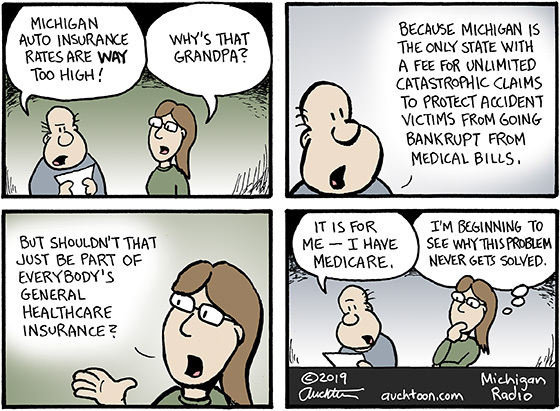 And if you are on Medicare, you also enjoy a great deal of financial protection. But that leaves a lot of holes and seems like an awfully random (and inefficient) way to insure people. The state legislature is currently looking at ways to reduce auto insurance rates. One perennial target is the MCCA fee (currently $192 per year per driver), which funds the unlimited lifetime coverage for medical expenses resulting from auto accidents. There are certainly improvements to be made. (Greater transparency on how rates are determined would be a great start.) But as the legislators consider capping or eliminating the MCCA fee, I hope they are also considering the bigger picture, like fixing the messed up healthcare system. 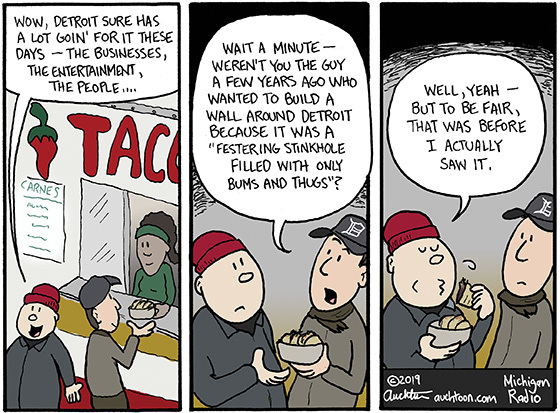 Not too long ago when I would draw a cartoon related to the city of Detroit, a good portion of the feedback I’d get included suggestions to build some sort of wall around the city to seal it off from the rest of Michigan. At the time, I recognized these not as legitimate proposals, but folks either venting their frustrations or mongering their fears. Now I’m not so sure they weren’t perfectly serious. I mean, their argument was that Detroit was different and dangerous. We had made bad deals and they were soaking us, taking our money. Worst, they were invading our land and bringing their drugs and crime. Rapists. I’m sure many were fine people, but…. You see where I’m going with this, right? To be clear, I am not trying to make an apples-to-apples case for Detroit circa 2013 and the Mexican border circa 2019. There are lots and lots of very obvious differences. What I am saying is that there are lessons to be learned. The first: The desire to build large physical barriers is reactive — a seemingly simple solution to a complex problem. But you have to ask: Functionally, practically, financially, how would it work? The honest answer is: Not well, even in the unlikely event it could be completed. The second: Think about how much better off Detroit and Michigan are today by working cooperatively, not punitively. Everything is certainly not sunshine and rainbows — there are still (and will always be) real issues. But we should look to solve problems, not mask them. Also as always, these little essays that follow are not supposed to explain the cartoon. The cartoons should stand (or die) on their own. And no amount of “Don’t you get it? It’s funny because…” can revive a dead cartoon. Mostly the essays are here to add a little context, provide more depth. Sometimes they explore a different view or present additional axes for me to grind. It’s actually meant to be hopeful. Yes, it is disheartening that drivable roads, drinkable water, and functioning schools should be fairly simple to achieve. But they aren’t. 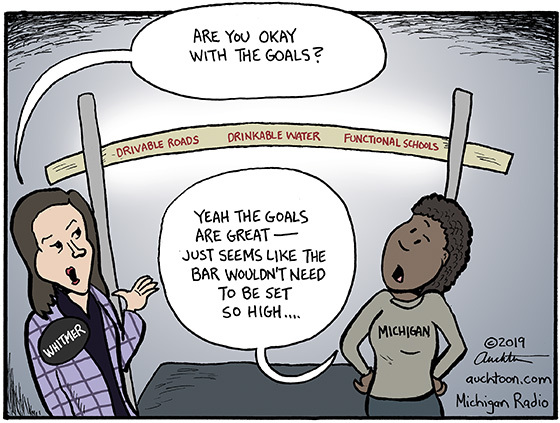 And we Michiganders have been fooling ourselves for far too long to think that it should be easy. There is no magic solution. We can’t cut taxes or throw money or political gimmick our way to where we need to go. It will take planning and commitment and real work. I think Governor Whitmer set the right tone with her speech at the swearing in ceremony this week. Let’s hope that it carries through 2019.